January is National Train Your Dog Month! Training is a wonderful way to overcome the winter blues for you and your pup. The benefits of training include increased problem-solving skills, mental exercise and stimulation (especially helpful if weather keeps you indoors), and bonding time for you and your dog. Whether you’re attending a group class, working one-on-one with a trainer, or training your dog at home, here are the top tips to make your training sessions fun and successful. Know the behavior you’re going to ask your dog to do and what signal you are going to use to ask for that behavior. Only reward if your dog does the behavior you asked. If you’re not clear on your intentions, it’s hard for your dog to follow through. Rewards are good! They pay your dog for doing what you wanted and keep them coming back for more. Train with different types of rewards including different foods, praise, toys, play time or other activities your dog enjoys. Save their favorites (most exciting) for training new behavior or for when you increase the difficulty, for example, when you go outside where distractions are abundant. Asking for the same behavior many times in a row can get tedious for you and your dog. Take pet and play breaks, alternate the skills you work on and change locations (if possible) to keep your pup excited and engaged. End your training sessions on a good note. A few minutes of play with a beloved toy, another dog or with you can help a dog retain what they just learned in your training session. If you’re working on something new or difficult for your pup, end with a few reps of something easier that your dog knows well. 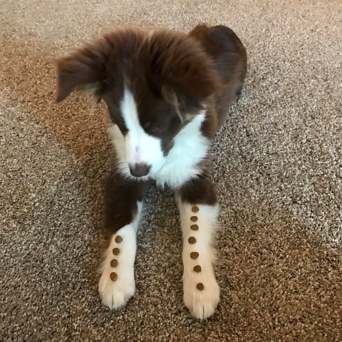 If you’re looking for a new challenge for you and your dog, consider turning a behavior your dog does or offers naturally (without you asking) into a trick! The benefit is that your dog already likes to do this behavior. Examples include jumping in a circle, resting their head on your lap, howling, or sneezing. When your dog offers this behavior, reward it. This can cause your dog to offer the behavior more to earn that reward. Once your dog is offering the behavior more frequently, add a verbal cue or word to identify it as your dog offers the behavior. This helps your dog associate the behavior with the word. With practice, you’ll be able to say the word and your dog will respond with the new behavior, resulting in a new trick to show off that your dog loves too! Celebrate National Dog Training Month by training your dog for 5-15 minutes, three days a week. These short and sweet sessions are easy to accomplish and still reap all the benefits. If you’re having trouble teaching your dog a new behavior or want additional training support, find a Camp Bow Wow location near you.